It’s a nasty disease that got all the organic tomato growers in our area last summer. It gets every last plant. The topic of tomato blight came up in the comments of this post about natural pest control. If it is only one plant that has blight I would pull it up. Blight spreads really easily through touch. This could be your hands, or insects going from one plant to another. After touching the plant that is affected, make sure to wash your hands really well with soap and water so that it does not spread further. If it is on several plants, you will want to remove all of the leaves and branches that are affected making sure to not touch any other areas of the plant or drop the pieces that you remove. Really the best way to prevent it is before you plant, with powdered milk or crushed eggshells. You can try to place powdered milk into the soil around the plant, just make sure not to disturb the roots. Also when you water those plants, just water the soil not the plant if possible. (I know that it rains, so this won’t be a real fix.) You can also try spraying your plant with compost water. What this is is really good compost that is in non-chlorinated water. (Just leave your water out for at least 24 hours to remove the chlorine.) The compost will have good microbes in it to help fight the blight naturally. Blight is difficult to get rid of though. Next year, you will want to plant your tomatoes in a different location since there will still be blight in your soil in that area. You can just prepare the soil next year the way that I described in the post above to prevent blight from forming. I also came across a couple of sources to help solve the problem, although I admit I haven’t had to use any of them myself. Mix 1 part skim milk and 9 parts water and apply with a hand-held squirt bottle to the point of run-off in the early part of the summer to discourage diseases from getting started. 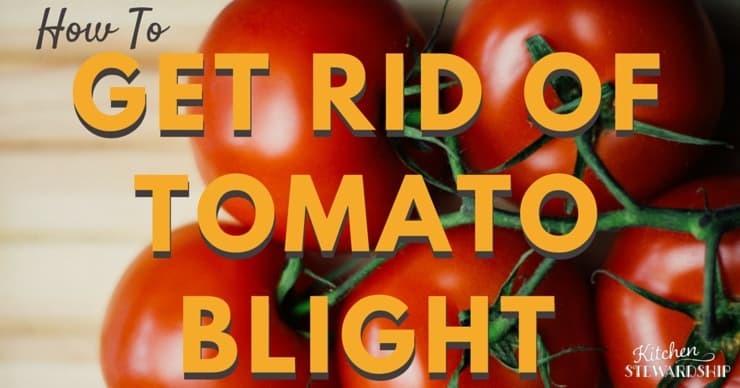 You can also take steps to prevent blight when planting your tomatoes. 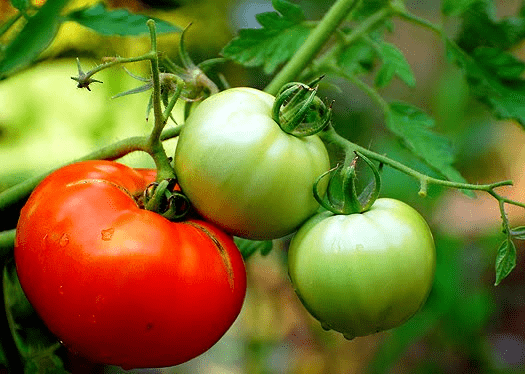 Our contributor Haley has an awesome post on the many varieties of tomatoes available, plus a simple tomato and mint salad recipe! 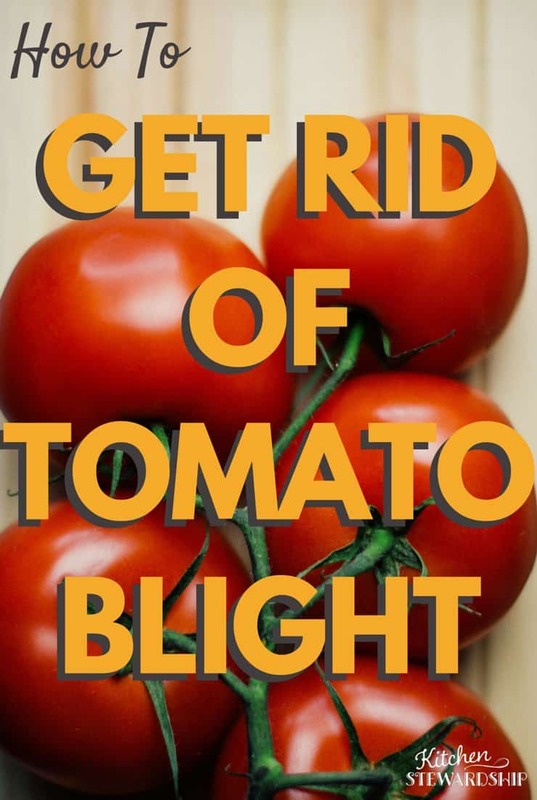 Prevent Blight for Next Year’s Tomatoes! Spray the garden in late fall and early spring with: 2 Tbs bleach + 2 Tbs baby shampoo in a gallon of water. This covers 100 sq. ft. During the growing season, spray plants every two weeks with an all-purpose liquid fruit tree spray following package instructions. I don’t know if one can find organic fruit tree spray though, but this sounds like a serious problem! Check out these FREE gardening classes from Craftsy – pause and replay to catch all the tips. Once you sign up you can “attend” at any time! I have that page because I keep a gardening binder. I tear out anything of interest, and in the winter, I organize all the pages into sections like “vegetables” “starting seeds” “flowering plants” and “houseplants.” Tomatoes have their own section! Complicated little buggers. If you’d like to find out the 8 things I put the tomato planting hole check out my post here. So I do that mixture spraying on the soil itself in the fall and early spring? what if I usually cover the garden over with a layer of leaves and add in new dirt the following year? Blight got me late last year. I just rolled with it — I’d gotten lots of tomatoes already, so I picked all the green ones and made salsa verde. This year I haven’t seen any YET, probably because 1. I removed all old vines and rotting tomatoes at the end of the growing season, 2. I rotated the garden, so tomatoes aren’t growing in the same spot, and 3. I planted only the varieties that survived the best last year. I didn’t save seed, though, because I heard blight can be carried in seed — I used seed saved the previous year. I have a terrible blight problem in my garden. there are woods in the common area in my neighborhood and i see spots on many of the leaves so it seems it will be an ongoing problem. I cut the leaves of where it is apparent but will not the the leaves from the trees falling in my garden. Will repeated sprays of the skim milk solution combat this or do you have any other ideas? Thanks. I eat tomatoes like apples and wouldnt last a year of resting the ground anyway. Well, I know the trees have blight and/or septuria. I can see it on the leaves that fall in my garden. Was just wondering if you had any ideas on the best way to combat an ongoing blight/septuria problem that will always be present. Thanks for the reply and yes it is very sad. My tomatoes are NOT thriving. I think I might have used too much cattle manure…although it was beautiful and black and odorless! I’m going to read this and maybe I can save my tomatoes! Thanks! i mix composted manure (well aged ,really black,no smell,)in a 50 gal drum ,i put about three heaping large pitch fork full of manure in the drum,i filll it with water,(and let set a couple days to get chlorine out i have city water).then i mix well. water in a circle in close to stem ,but not right into root area stay back a little in a circle around plant,i have had great success and have never hurt anything yet. no picking yet i actually just got my first 2 tiny little green balls. but the plants are almost as tall as me for sure! They are insanely covered in flowers ive never had good tomato results so im hopeful! Nitrogen is in the air which is 80% Nitrogen, not in lightning. Lightning causes the Nitrogen to mix with the rain water. hey wondering do you put the fast acting lime at the roots of your tomato plants? I want to try this. Are the tomatoes still edible though if the plant has blight? I guess they are I just bought some from my local organic farm. Didn’t see it till I got home. I have the late blight and I did plant the small tomato plants in eggshell in there dug holes. I bought small plants already started. When I dug the hole I put in some eggshells. I used to put in compost as well but thought I would not do it this year just in case the blight was carried in the compost. I laid black heavy plastic on the ground and made small holes in it to plant the small plants. Didn’t help other than having no weeds. 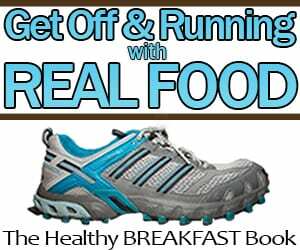 I have had this problem for many years and have tried everything but the powdered milk treatment. Our season (Northern Ontario, Canada) is too short to solarize the ground for close to 2 months as our growing season is only about 4 months long.